A triple homicide has so profoundly shocked a small Mississippi town, they almost consider canceling the big high school football game—almost. Instead, they settle for some quick words of prayer before kick-off. After all, only one of the victims is a local. Unfortunately, one of the outsiders happened to be a congressman’s daughter. 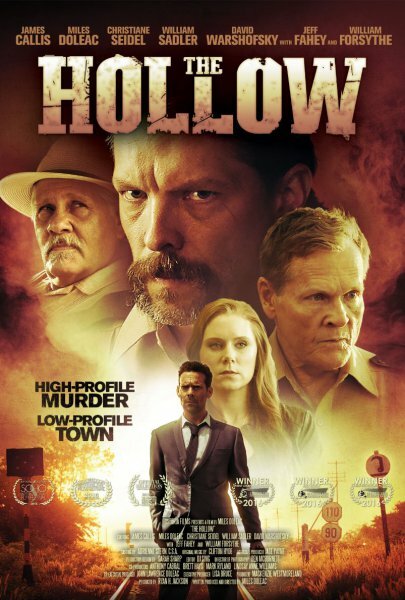 Once again, two FBI agents get a chilly reception in Mississippi, but the bitter alcoholic one doesn’t do much to endear himself in Miles Doleac’s The Hollow (trailer here), which opens this Friday in New York. As cops go, meth-dealing sheriff’s deputy Ray Everett is one of the worst. Perversely, he recommended the clearing by the lake to the out-of-towners as a good make-out spot, even though he knew it attracted sketchy types. To make matters worse, he was seen by at least one customer getting special consideration from the third victim, “troubled” cheerleader Kami King. Ordinarily, he could keep a garden variety triple homicide under wraps, but this is literally a Federal case. Everett takes an instant dislike to Special Agent Vaughn Killinger, but to be fair, almost everyone does. His ex-wife’s allegations of abuse nearly destroyed his career and his relationship with his young son. These days, he mainly copes through binge drinking. However, his partner, Agent Sarah Desoto still stands by him, even though she feels guilty for allowing the affair that led to all his personal problems. It seems strange the agency J. Edgar Hoover built lets them carry on as partners, but whatever. In between hook-ups and flare-ups, they start sniffing around Big John Dawson, the town’s shadowy benefactor and Everett’s not so secret supplier. It is rather sadistically entertaining to see how dissipated and unruly James Callis gets as Killinger. He drinks more than the cast of a Hong Sang-soo film (in a dry county) and sweats more than Ned Beatty in Deliverance. Yet, somehow his chemistry with Christiane Seidel’s Desoto kind of-sort of works. Dloeac himself just oozes pond-scummy sleaze as Everett, while William Forsythe’s Big John Dawson chews the furniture and everything else not nailed down like deep fried pickles. Unfortunately, 1990’s cult favorite William Sadler (Die Hard 2, Tales from the Crypt: Demon Knight) is grossly under-utilized as Sheriff Beau McKinney. There are some pretty huge credibility gaps in Hollow (you’d think the Feds might want to dust the dime bag of meth found on the victim for prints, but apparently not). However, Doleac goes all in on sordid scandal and vice, which certainly makes it watchable. It probably can’t justify the cost of a Manhattan movie ticket, but this is exactly the sort of film Netflix streaming was invented for. In the meantime, The Hollow opens this Friday (10/7) in New York, at the Cinema Village.